BISS GCh. 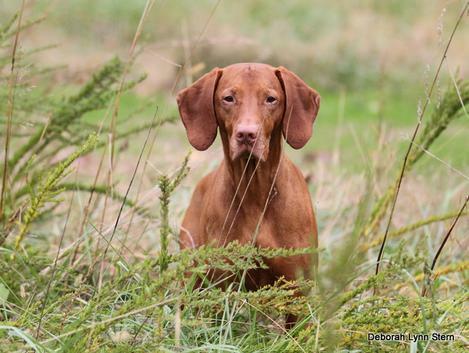 Tivoliz CC Joint Venture, JH, aka Owe'n, is a collaboration of all the good things in vizsladom and continues to be a "Joint Venture" with many good friends in the breed. The sole male in Siren's second litter, Owe'n was destined to stay. His sweet kisses and lip nibbles cinched it!! Owe'n has set out to prove the saying that "big things come in small packages" and he is well on his way to doing just that. In only 11 show appearances, 9 of which were Specialties or Supported Entries, Owe'n finished his Championship at a year of age with four major wins. 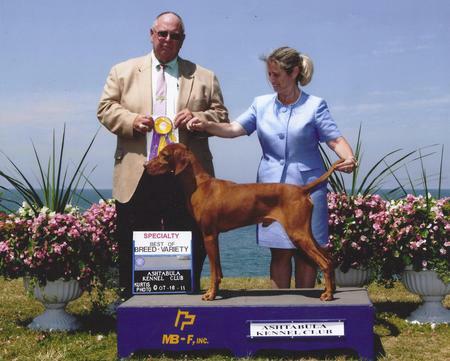 Since then, he has dabbled in the breed ring on Specialty and Supported Entry occasions and has earned multiple Best in Specialty Show wins as well several Selects, Awards of Merit and Multiple Group Placements. Now a Veteran, Owe'n has proven himself not only as a Special in the Breed ring but also as a Top Producing Sire in both 2009 and 2011. 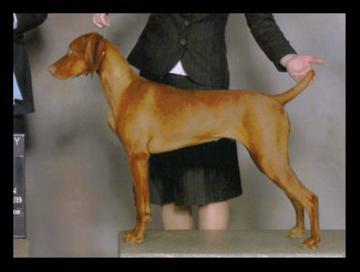 His first five litters realized 16 Champions to his credit as well as offspring titled in both the field and the agility arenas.